The National Institute of Technology, Tiruchirappalli presents Pragyan’14, the tenth edition of the ISO 9001:2008 certified International Techno-management festival. This being NITT’s Golden Jubilee year, we are all set to break records and recreate history. With a host of new and exciting events lined up ranging from robotics and management to coding and crime solving, this edition of Pragyan promises to cater to the needs of all. 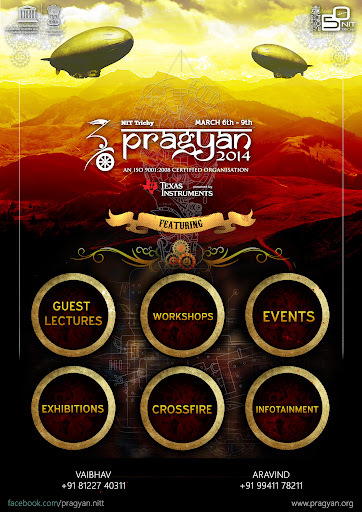 Pragyan’14 gives you an opportunity to win up to 1.2 Million INR. Here are some of the highlights of Pragyan’14. A mish-mash of events, where one would have to be a jack of all trades to succeed for call upon you to be well-informed, resourceful, creative and above all, to think outside the box. Lets take a breath of fresh air in the midst of all this formal buzz. From stepping behind the camera and donning the director’s cap to hunting for hidden treasures or putting on your thinking caps and solving a mystery this is where you unwind. With the advent of the age of machines, Pragyan’14 captures its essence in these varied challenges ranging from ‘simply’ following a line to dunking their way to the podium. Robovigyan guarantees an awesome display of skills, innovation and techie grit. Moreover this year Texas Instruments will provide all components required for building your bot absolutely FREE of cost! 10 events to breed the new age technocrats. Here is a chance to put your knowledge & skills into action. Here are those events that test the management and business acumen of participants. A share-market shark or an apprentice? You decide. At the end of the day, it’s all a good business, and that’s the way the cookie crumbles. Are you a code freak? Here is your chance to put your skills to test with coders around the world. Ever thought of a competition on Paper planes? Informals brings you the lighter side of technology. Here’s some hands on experience. With workshops that teach you to launch a satellite, build speech controlled bots, quad copters and much more, Pragyan’14 promises to launch you towards something you might not have even known you had. We believe that entertainment and work go hand in hand. With the likes of Thaalavaatam and Roadies gracing our stages we have a whole range of events lined up for you. Pragyan’s Got Talent, introduced for the first time last year is one of the highlights of Pragyan’14 where you get to put up your best work. Be it dancing, theatre or any other skill, this is your platform. The series of guest lectures at Pragyan serve to educate and entertain the attendees at Pragyan. Every year, notable individuals give thought-provoking lectures on a variety of topics, ranging from Astrophysics to Philosophy. Last year Pragyan hosted lectures on Augmented Reality (Matt Mills), Neuro-technology (Rohan Dixit), Electronics (Steve Furber), Astrophysics (Thanu Padmanabhan), Rocket Technology (Tessy Thomas), Business (Gerard Rego), History (David Christian), and Nuclear Physics (Anil Kakodkar), among more. Our stage has witnessed in the past some phenomenal ideas coupled with radiant personalities, and come Pragyan’14 it’s going to be no different. Another major event is Crossfire, a panel discussion between some of the best debaters in India. It has always proved to be a crowd puller. The event brings together eminent public speakers from various walks of life to the forum of issues. Pragyan Workshops aim to deliver a hands-on experience. They provide an outstanding platform to interact with the peers of the subject and students with similar interests and develop the required temperament to excel in the same. This year’s line-up includes Lie Detector Workshop, Satellite Launching Workshop, Speech, Internet and PC controlled Robot, Surveillance Quad copter, Big Data Microsoft, IBM, Seismic Design, Stock Market and Financial Risk Analysis and Solar Mobile Charging. Sangam is a forum for exchange of knowledge between participants, peer students, academicians, technocrats, industrialists and corporates. Also, the exhibition aims to expose one with the most cutting edge advancements and how this can cater to the needs of the common man. Taking the borders of Pragyan outside Trichy has always been our driving force. With this in mind, Pragyan’14 took to the Arabian Peninsula in December’14 with a quiz programme for school students. Pragyan Social Responsibility (PSR) in association with The Third Dimension, the aero-modeling club of NITT organized Catalyst to create interest and spread awareness about science among underprivileged school students. Wired was Pragyan’s initiative to introduce the field of robotics to school students. The second edition of Srishti and the microcontroller event Pragati were also held this year. This year also saw Pragyan get UNESCO patronage in endorsement of our exceptional activities that impact the development science, technology and education. ISO 20121:2012, a standard attributed to only London Olympics till recently has become the pride of Pragyan. So what are you waiting for? Trichy is the place to be in this March. For more details, log on to www.pragyan.org.